The Garuda Purana is one of 18 Mahāpurāṇ of texts in Hinduism. It is a part of Vaishnavism literature corpus, primarily centering around Hindu god Vishnu praises all gods. Composed in Sanskrit, the earliest version of the text may have been composed in the first millennium BCE, but it was likely expanded and changed over a long period of time. The Garuda Purana text is known in many versions, contains 16000 verses. Its chapters encyclopedically deal with a highly diverse collection of topics. The text contains cosmology, mythology, relationship between gods, ethics, good versus evil, various schools of Hindu philosophies, the theory of Yoga, the theory of "heaven and hell" with "karma and rebirth", ancestral rites and soteriology, rivers and geography, types of minerals and stones, testing methods for gems for their quality, listing of plants and herbs, various diseases and their symptoms, various medicines, aphrodisiacs, prophylactics, Hindu calendar and its basis, astronomy, moon, planets, astrology, architecture, building home, essential features of a Hindu temple, rites of passage, charity and gift making, economy, thrift, duties of a king, politics, state officials and their roles and how to appointment them, genre of literature, rules of grammar, and other topics. The final chapters discuss how to practice Yoga (Samkhya and Advaita types), personal development and the benefits of self-knowledge. The Padma Purana categorizes the Purana, along with itself, Bhagavata Purana and Vishnu Purana, as a Sattva Purana (a purana which represents goodness and purity). The text, like all Mahapuranas, is attributed to sage Veda Vyāsa in the Hindu tradition. Pintchman estimates that the text was composed sometime in the first millennium of the common era, but it was likely compiled and changed over a long period of time. Gietz et al place the first version of the text only between the fourth-century CE and the 11th-century. Leadbeater states that the text is likely from about 900 CE, given that it includes chapters on Yoga and Tantra techniques that likely developed later. Other scholars suggest that the earliest core of the text may be from the first centuries of the common era, and additional chapters were added thereafter through the sixth-century or later. The version of Garuda Purana that survives into the modern era, states Dalal, is likely from 800 to 1000 CE with sections added in the 2nd-millennium. Pintchman suggests 850 to 1000 CE. Chaudhuri and Banerjee, as well as Hazra, on the other hand, state it cannot be from before about the 10th- or 11th-century CE. The text exists in many versions, with varying numbers of chapters, and considerably different content. Some Garuda Purana manuscripts have been known by the title of Sauparna Purana (mentioned in Bhagavata Purana section 12.13), Tarksya Purana (the Persian scholar Al-Biruni who visited India mentions this name), and Vainateya Purana (mentioned in Vayu Purana section 2.42 and 104.8). In late 19th-century and early 20th-century, a text called Garudapuranasaroddhara was published, then translated by Ernest Wood and SV Subrahmanyam. This, states Ludo Rocher, created major confusion because it was mistaken for Garuda Purana, when it is not, a misidentification first discovered by Albrecht Weber. Garuda-purana-saroddhara actually is the original bhasya work of Naunidhirama, that cites a section of now non-existent version of Garuda Purana as well as other Indian texts. The earliest translation of one version of Garuda Purana, by Manmatha Nath Dutt, was published in early 20th-century. The text revolves around Vishnu, as recited by Garuda. Above: Vishnu and Lakshmi on Garuda (Delhi National Museum). The Garuda Purana is a Vaishnava Purana and has, according to the tradition, 19,000 shlokas (verses). However, the manuscripts that have survived into the modern era have preserved about eight thousand verses. These are divided into two parts, a Purva Khanda (early section) and an Uttara Khanda (later section). The Purva Khanda contains about 229 chapters, but in some versions of the text this section has between 240–243 chapters. The Uttara Khanda varies between 34 to 49 chapters. The Uttara Khanda is more often known as Pretakhanda or Pretakalpa. The Garuda Purana was likely fashioned after the Agni Purana, the other major medieval India encyclopedia that has survived. The text's structure is idiosyncratic, in that it is a medley, and does not follow the theoretical structure expected in a historic Puranic genre of Indian literature. It is presented as information learned from Vishnu by Garuda (the man-bird vehicle of Vishnu), and then narrated by Garuda to sage Kashyapa, which then spread in the mythical forest of Naimisha reaching sage Vyasa. The largest section (90%) of the text is Purva Khanda that discusses a wide range of topics associated with life and living. The remaining is Pretakhanda, which deals primarily with rituals associated with death and cremation. The cosmology presented in Garuda Purana revolves around Vishnu and Lakshmi, and it is their union that created the universe. Vishnu is the unchanging reality called Brahman, while Lakshmi is the changing reality called Maya. The goddess is the material cause of the universe, the god acts to begin the process. The cosmogenesis in Garuda Purana, like other Puranas, weaves the Samkhya theory of two realities, the Purusha (spirit) and Prakriti (matter), the masculine and feminine presented as interdependent, each playing a different but essential role to create the observed universe. Goddess Lakshmi is the creative power of Prakriti, cosmic seed and the source of creation. God Vishnu is the substance of Purusha, the soul and the constant. The masculine and the feminine are presented by the Garuda Purana, states Pintchman, as an inseparable aspect of the same divine, metaphysical truth Brahman. The Garuda Purana, states Madan, elaborates the repeatedly found theme in Hindu religious thought that the living body is a microcosm of the universe, governed by the same laws and made out of the same substances. All the gods are inside the human body, what is outside the body is present within it as well. Body and cosmos, states Madan, are equated in this theme. 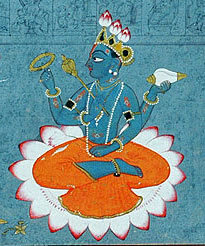 Vishnu is presented by the text as the supreme soul within the body. The text describes Vishnu, Vaishnava festivals and Puja (worship), and offers Mahatmya—a pilgrimage tour guide to Vishnu-related sacred places. However, the Garuda Purana also includes significant sections with reverence for Shaiva, Shakti and Smarta traditions, including the Panchayatana puja of Vishnu, Shiva, Durga, Surya (Sun) and Ganesha. The Garuda Purana describes a 8x8 (64) grid Hindu Temple Floor Plan in chapter 47 of Purvakhanda. The Garuda Purana includes chapters on the architecture and design of a temple. It recommends that a plot of ground should be divided into 64 squares, with the four innermost squares forming the Chatuskon (adytum). The core of the temple, states the text, should be reachable through 12 entrances, and the walls of the temple raised touching the 48 of the squares. The height of the temple plinth should be based on the length of the platform, the vault in the inner sanctum should be co-extensive with adytum's length with the indents therein set at a third and a fifth ratio of the inner vault's chord. The arc should be half the height of pinnacle, and the text describes various ratios of the temple's exterior to the adytum, those within adytum and then that of the floor plan to the Vimana (spire). The second design details presented in the Garuda Purana is for a 16 square grid, with four inner squares (pada) for the adytum. The text thereafter presents the various ratios for the temple design. The dimensions of the carvings and images on the walls, edifices, pillars and the murti are recommended by the text to be certain harmonic proportions of the layout (length of a pada), the adytum and the spire. Temples, asserts the text, exist in many thematic forms. These include the Bairaja (rectangle themed), Puspakaksa (quadrilateral themed), Kailasha (circular themed), Malikahvaya (segments of sphere themed) and the Tripistapam (octagon themed). These five themes, claims Garuda Purana, have created 45 different styles of temples, from the Meru style to Shrivatsa style. Each thematic form of temple architecture permits nine styles of temples, and the Purana lists all 45 styles. The inner edifice of a temple is best in five shapes, in these various styles of temples, and the edifice can be triangle, lotus-shaped, crescent, rectangular and octagonal, asserts the text. The text thereafter describes the design guidelines for the Mandapa and the Garbha Griha. The temple design, states Jonathan Parry, follows the homology at the foundation of Hindu thought, that the cosmos and body are harmonious correspondence of each other, the temple is a model and reminder of this cosmic homology. Gems: how to buy them? First the shape, color, defects or excellences of a gem should be carefully tested and then its price should be ascertained in consultation with a gem expert who has studied all the books dealing with the precious stones. The Garuda Purana describes 14 gems, their varieties and how to test their quality. The gems discussed include ruby, pearl, yellow sapphire, hessonite, emerald, diamond, cats eye, Blue Sapphire, coral, red garnet, jade, colorless quartz, and bloodstone. The technical discussion of gems in the text is woven with its theories on the mythical creation of each gem, astrological significance and talisman benefits. The text describes the characteristics of the gems, how to clean and make jewelry from them, cautioning that gem experts should be consulted before buying them. For pearl, for example, it describes using Jamvera fruit juice (contains lime) mixed with boiled rice starch in order to clean and soften pearls, then pierced to make holes for jewelry. A sequential Vitanapatti method of cleaning, states the text, wherein the pearls are cleaned with hot water, wine and milk gives the best results. A pearl, asserts the text, should be examined by friction test which it describes. Similar procedures and tests are described for emerald, jade, diamonds and all 14 gems the text includes. A gift, made at a proper time and place, to a deserving person, in a true spirit of compassionate sympathy, carries the merit of all sorts of pious acts. The text similarly discusses the following virtues—right conduct, damah (self-restraint), ahimsa (non-killing, non-violence in actions, words and thoughts), studying the Vedas, and performing rites of passage. The text presents different set of diet and rites of passage rules based on the varna (social class) of a person. The Brahmin, for example, is advised to forego killing animals and eating meat, while it is suggested to undertake Upanayana (holy thread ceremony) at the youngest age. No dietary rules are advised for Shudra, nor is the thread ceremony discussed. These chapters on laws of virtue, in one version of the Garuda Purana, are borrowed and a duplicate of nearly 500 verses found in the Yajnavalkya Smriti. The various versions of Garuda Purana show significant variations. The Garuda Purana asserts that the highest and most imperative religious duty is to introspect into one's own soul, seeking self-communion. The chapter 108 and thereafter, present Garuda Purana's theories on Nitichara (नित्याचार, ethics and right conduct) towards others. Quit the country where you can find neither friends nor pleasures, nor in which is there any knowledge to be gained. Little by little a man should acquire learning. Little by little a mountain should be climbed. Little by little desires should be gratified. Save money for times of distress, asserts Garuda Purana, but be willing to give it up all to save your wife. It is prudent to save a family if that requires sacrificing oneself, and it is prudent to save a village if that requires sacrificing one family, states the Purana. It is prudent to save a country if left with a choice to save the country or a village. Yet, in verses that follow, the Garuda Purana asserts that a man should renounce that country whose inhabitants champion prejudice, and forego the friend who he discovers to be deceitful. The text rhetorically cautions against application of knowledge which is wedded to meanness, cautions against pursuit of physical beauty without ennobling mind, and cautions against making friends with those who abandon their dear ones in adversity. It is the nature of all living beings, asserts the Garuda Purana, to pursue one's own self-interest. Yet, do not acquire wealth, states the text, through vicious means or by bowing down to your enemies. Men of excellence, asserts the Purana, live with honest means, are true to their wives, pass their time in intellectual pursuits and are hospitable to newcomers. Eternal are the rewards when one weds one's knowledge with noble nature, deep is the friendship roused by connection of the soul, states Garuda Purana. The discussion on ethics is mixed in other chapters of Garuda Purana. Governance is part of the Nitisastra section of the Garuda Purana, and this section influenced later Indian texts on politics and economy. The Purvakhanda, from chapter 111 onwards describes the characteristics of a good king and good government. Dharma should guide the king, the rule should be based on truth and justice, and he must protect the country from foreign invaders. Taxation should be bearable, never cause hardship on the merchants or taxpayers, and should be similar in style to one used by the florist who harvests a few flowers without uprooting the plants and while sustaining the future crops. A good government, claims Garuda Purana, advances order and prosperity for all. A stable king is one whose kingdom is prosperous, whose treasury is full, and who never chastises his ministers or servants. He secures services from the qualified, honest and virtuous, rejects the incapable, wicked and malicious, states chapter 113 of the text. A good government, states the Purana, collects taxes like a bee collecting honey from all the flowers when ready and without draining any flower. The chapters 146 to 218 of the Garuda Purana's Purvakhanda present the Dhanvantari Samhita, its treatise on medicine. The opening verses assert that the text will now describe pathology, pathogeny and symptoms of all diseases studied by ancient sages, in terms of its causes, incubative stage, manifestation in full form, amelioration, location, diagnosis and treatment. Parts of the pathology and medicine-related chapters of Garuda Purana, states Ludo Rocher, are similar to Nidanasthana of Vagbhata's Astangahridaya, and these two may be different manuscript recensions of the same underlying but now lost text. Other chapters of Garuda Purana, such as those on nutrition and diet to prevent diseases, states Susmita Pande, are similar to those found in the more ancient Hindu text Sushruta Samhita. The text includes various lists of diseases, agricultural products, herbs, formulations with claims to medicinal value and such information. In chapters 202 and 227 of the Purvakhanda, for example, Sanskrit names of over 450 plants and herbs are listed with claims to nutritional or medicinal value. The chapter 226 of the text presents veterinary diseases of horse and their treatment. The verses describe various types of ulcers and cutaneous infections in horses, and 42 herbs for veterinary care formulations. It is knowledge that dispels this notion of duality. realise their oneness with the supreme Brahman. Realization of this oneness is called Mukti. The last ten chapters of the Purvakhanda is dedicated to Yoga, and is sometimes referred to as the Brahma Gita. This section is notable for references to Hindu deity Dattatreya as the Guru of eight limb Yoga. The text describes a variety of Asanas (postures), then adds that the postures are means, not the goal. The goal of yoga is meditation, samadhi and self-knowledge. The Garuda Purana in chapter 229, states Ian Whicher, recommends using saguna Vishnu (with form like a murti) in the early stages of Yoga meditation to help concentration and draw in one's attention with the help of the gross form of the object. After this has been mastered, states the text, the meditation should shift from saguna to nirguna, unto the subtle, abstract formless Vishnu within, with the help of a guru (teacher). These ideas of Garuda Purana were influential, and were cited by later texts such as in verse 3.3 of the 17th-century Arthabodhini. By which your former fathers have departed. both kings, in funeral offerings rejoicing. with istapurta in the highest heaven. United with thine own body, full of vigor. The second section of the text, also known as Uttara Khanda and Pretakalpa, includes chapters on funeral rites and life after death. This section was commented upon by Navanidhirama in his publication Garuda Purana Saroddhara and translated by Wood and Subramanyam in 1911. A dead child, who died before completing his second year, should be buried instead of being cremated, and no sort of Sraddha or Udaka-kriya is necessary. The friends or relatives of a child, dead after completing its second year of life, shall carry its corpse to the cremation ground and exhume it in fire by mentally reciting the Yama Suktam (Rigveda 10.14). The Pretakhanda is the second and minor part of Garuda Purana. It is, states Rocher, "entirely unsystematic work" presented with motley confusion and many repetitions in the Purana, dealing with "death, the dead and beyond". Monier Monier-Williams wrote in 1891, that portions of verses recited at cremation funerals are perhaps based on this relatively modern section of the Garuda Purana, but added that Hindu funeral practices do not always agree with guidance in the Garuda Purana. Three quite different versions of Pretakhanda of Garuda Purana are known, and the variation between the chapters, states Jonathan Parry, is enormous. ^ Leadbeater 1927, p. xi. ^ a b c d Dutt 1908. ^ a b K P Gietz 1992, p. 871, item 5003. ^ a b Pintchman 2001, pp. 91–92 with note 4. ^ a b c d e f g h i j k Dalal 2014, p. 145. ^ a b c d e f g h i j Rocher 1986, pp. 175–178. ^ Rocher 1986, pp. 78–79. ^ a b Sensarma P (1992). "Plant names - Sanskrit and Latin". Anc Sci Life. 12 (1–2): 201–220. PMC 3336616. PMID 22556589. ^ Wilson, H. H. (1840). The Vishnu Purana: A system of Hindu mythology and tradition. Oriental Translation Fund. p. xii. ^ a b c d Jonathan Parry (2003). Joanna Overing, ed. Reason and Morality. Routledge. pp. 209–210. ISBN 978-1135800468. ^ Leadbeater 1927, pp. xi, 102. ^ a b c d Rocher 1986, p. 177. ^ a b Pintchman 2001, p. 81. ^ a b c Rocher 1986, pp. 177–178. ^ a b Wood 1911. ^ a b c Pintchman 2001, pp. 81–83. ^ a b c Pintchman 2001, pp. 81–83, 88–89. ^ a b c Madan 1988, pp. 356–357. ^ Shrikala Warrier (2014). Kamandalu: The Seven Sacred Rivers of Hinduism. Mayur University. p. 260. ISBN 978-0-9535679-7-3. ^ T. A. Gopinatha Rao (1993). Elements of Hindu iconography. Motilal Banarsidass. pp. 129–131, 235. ISBN 978-81-208-0878-2. ^ Dutt 1908, pp. 23–26, 33–34, 67–76, 102–105, 209–224. ^ Dutt 1908, pp. 47–50, 58–64, 90–98. ^ a b c d e f g h i j k l m n Dutt 1908, pp. 113–117. ^ a b c d Kramrisch 1976, pp. 42, 132–134, 189, 237–241 of Volume 1. ^ Kramrisch 1976, pp. 340–344, 412, 423–424 with footnotes of Volume 2. ^ Maurice Bloch; Jonathan Parry (1982). Death and the Regeneration of Life. Cambridge University Press. p. 76. ISBN 978-1316582299. ^ Dutt 1908, p. 181. ^ a b c Dutt 1908, pp. 180–205. ^ Richard S. Brown (2008). Ancient Astrological Gemstones & Talismans - 2nd Edition. Hrisikesh Ltd. pp. 61, 64. ISBN 978-974-8102-29-0. ^ a b c d Dutt 1908, pp. 181, 190–191. ^ Dutt 1908, pp. 260–262. ^ a b Dutt 1908, p. 261. ^ a b c Dutt 1908, pp. 261–265. ^ S Vithal (1908). "The Parasariya Dharma Sastra". Journal of the Royal Asiatic Society. Asiatic Society of Bombay. XXII: 342. ^ Dutt 1908, pp. 315–352. ^ a b Dutt 1908, p. 320. ^ Dutt 1908, p. 323. ^ a b c d e Dutt 1908, p. 319. ^ Dutt 1908, p. 326. ^ Dutt 1908, pp. 336–345, Quote: Nobody is nobody's friend. Nobody is nobody's enemy. Friendship and enmity is bounded by a distinct chain of cause and effect (self-interest). – Chapter 114, Garuda Purana. ^ Narayana (Transl: A Haskar) (1998). Hitopadesa. Penguin Books. p. xiv. ISBN 978-0144000791. ^ Dutt 1908, pp. 328–347. ^ a b c Dutt 1908, p. 328. ^ Dutt 1908, pp. 329–330. ^ a b Dutt 1908, pp. 333–335. ^ a b c Susmita Pande (Editor: Vinod Chandra Srivastava) (2008). History of Agriculture in India. Concept. pp. 844–845. ISBN 978-81-8069-521-6. ^ a b Dutt 1908, pp. 422–676. ^ Dutt 1908, pp. 422–423. ^ Dutt 1908, pp. 698–705. ^ Dutt 1908, pp. 693–697. ^ Dutt 1908, p. 747. ^ Antonio Rigopoulos (1998). Dattatreya: The Immortal Guru, Yogin, and Avatara: A Study of the Transformative and Inclusive Character of a Multi-faceted Hindu Deity. State University of New York Press. p. 33. ISBN 978-0791436967. ^ a b Edwin Francis Bryant; Patañjali (2009). The Yoga sūtras of Patañjali. North Point Press. pp. 284–285, 314. ISBN 978-0865477360. ^ Ian Whicher (1998). The Integrity of the Yoga Darsana: A Reconsideration of Classical Yoga. State University of New York Press. p. 369. ISBN 978-0791438152. ^ Gerald James Larson; Karl H. Potter (2008). The Encyclopedia of Indian Philosophies: Yoga: India's philosophy of meditation. Motilal Banarsidass. p. 349. ISBN 978-8120833494. ^ a b Dutt 1908, pp. 305–306. ^ Mariasusai Dhavamony (1999). Hindu Spirituality. Gregorian University Press. p. 270. ISBN 978-8876528187. ^ Rocher 1986, p. 178. Dutt, Manmatha Nath (1908). The Garuda Puranam. SRIL, Calcutta (archived by Harvard University Library). Pintchman, Tracy (2001). Seeking Mahadevi: Constructing the Identities of the Hindu Great Goddess. State University of New York Press. ISBN 978-0791450086. Leadbeater, Charles Webster (1927). The Chakras. Theosophical Publishing House (Reprinted 1972, 1997). ISBN 978-0-8356-0422-2. Madan, T. N. (1988). Way of Life: King, Householder, Renouncer : Essays in Honour of Louis Dumont. Motilal Banarsidass. ISBN 978-81-208-0527-9. Wood, Ernest and SV Subrahmanyam (1911). The Garuda Purana Saroddhara (of Navanidhirama). SN Vasu (Reprinted by AMS Press, 1974). ISBN 0-404578098. This page was last edited on 2 April 2019, at 01:20 (UTC).